Meadow pots are for use and pleasure. Hand thrown and each individually decorated with brushwork text and foliage, these celebratory pots are for food and wine, fruit and flowers. Every summer’s footpath is a thrown plate decorated with an auspicious inscription by John Clare, and cornflowers, lavender and speedwell. Signed. 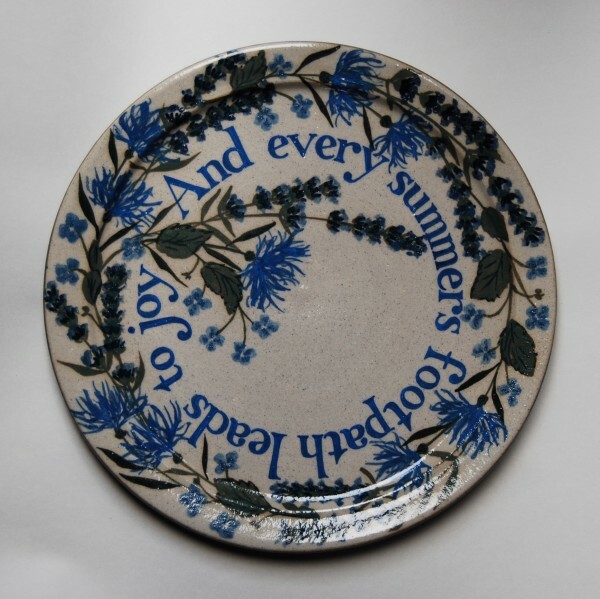 One-off in a series of plates, each hand-thrown in white stoneware and decorated by hand with inscription and appropriate foliage. 25cm (10″) size from £90, 30cm (12″) size from £120. Larger plates available. I make plates, winejugs and cups, fruit and salad bowls, flower jars and bowls, strawberry bowls, milk and cream jugs, olive bowls, oildippers, and teapots, among other things. 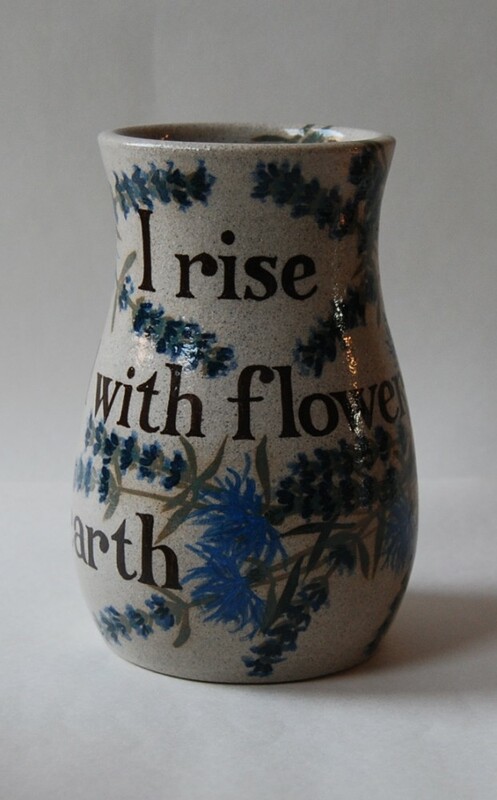 I always have some of these pots available to buy, and I often make them to commission for birthdays, anniversaries, civil partnerships and weddings, with a personal inscription (name/s, date) included in the design. I have a very extensive collection of beautiful inscriptions to choose from. Please contact me for details. (from Shakespeare’s Henry V), and it’s decorated with lavender, oregano, cornflowers and thyme. It takes 1 litre of wine, and can safely be chilled or warmed. This cheese plate has blue cheeses lettered in dark blue round the rim, with blue flowering herbs (garlic, thyme, rosemary and lavender). The olive bowl and pip bucket are some of my best-sellers; although I’ve made a lot of them, they’re all hand-made and individually decorated, some with black olives, some with green. The pip buckets are black inside. Signed, individually made in series. 12cm across x 6cm high approx. For sale £30 and £15 for the bucket, or £40 for the pair. 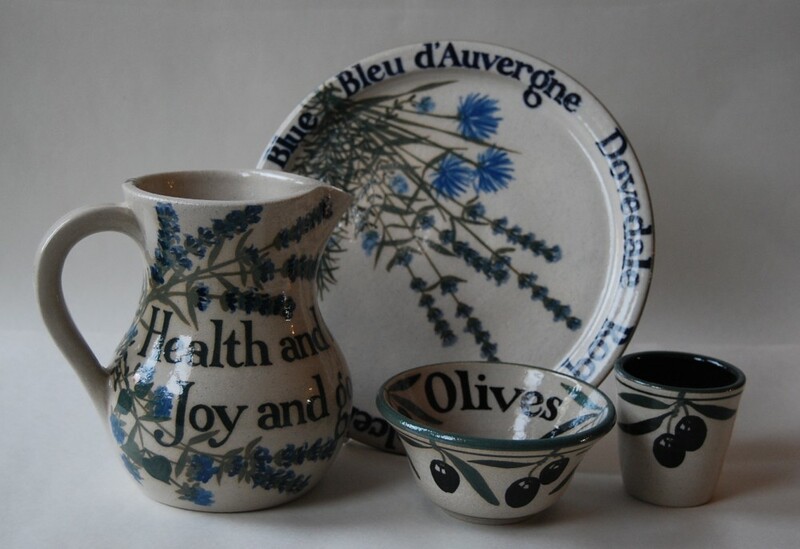 This image shows little lavender and garlic bowls (12cm across, £30; this size also available with rosemary, wild thyme, pinenuts, juniper, cobnuts, and of course olives), cornflower and lavender bowls (19cm across, £60 to £75, this size also available with strawberries or cherries, or as a nut bowl) and the larger Green Earth bowl (27cm across, £120; this size available with many different decorative designs, from £100). 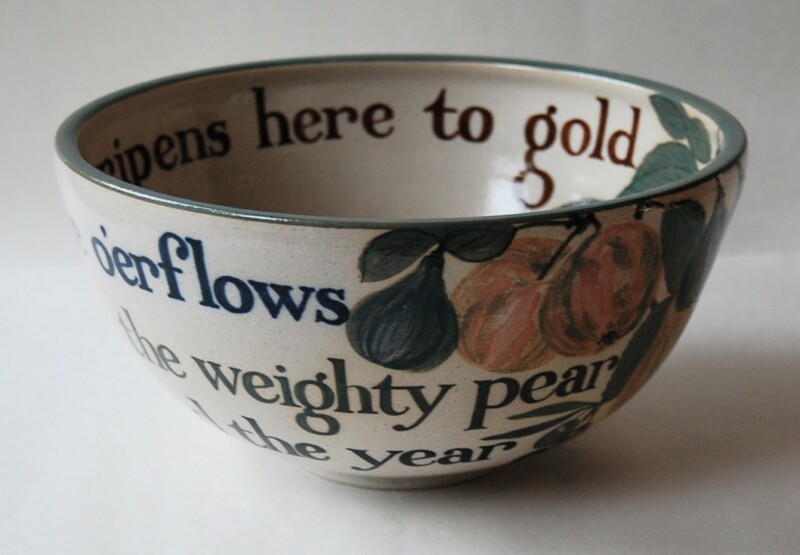 The Green Earth bowl is featured in one of the Work in Focus posts: please see Jolly Spring doth enter for more details. Signed one-off; 26cm across x 14cm high; for sale £250. I rise, girdled with flowers, and raise a paean to the earth. Signed one-off; 18cm high; for sale £80. Now sold. Other flower jars available from £80. 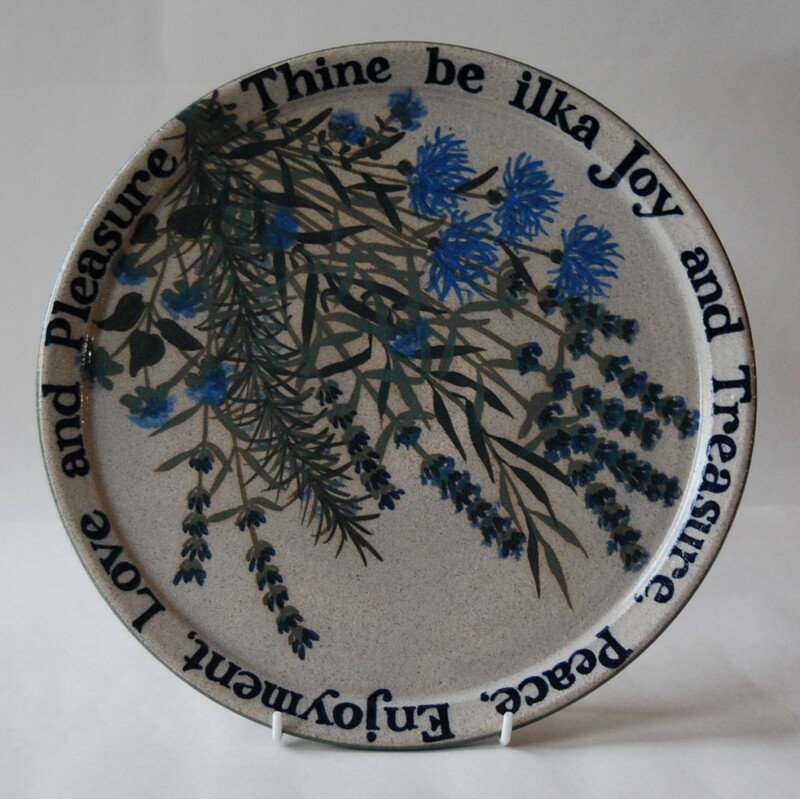 This large plate is 30cm across, with a beautiful text by Burns lettered in dark blue round the rim, and lavender, cornflowers, tarragon, rosemary, thyme, oregano and cornflowers. Signed one-off; 30cm across; for sale £120. Work available for purchase changes regularly – please leave me a note in the comments box below or click on contact details to find out what’s for sale now.